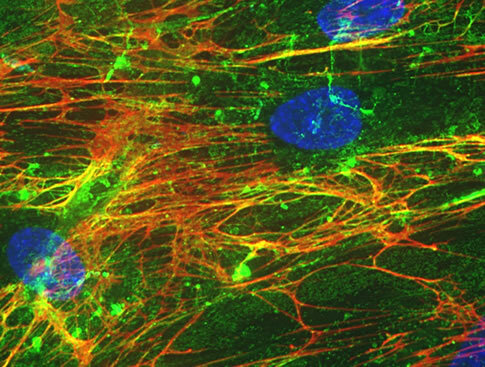 The Matrix Biology Program focuses on the extracellular matrix to develop therapeutics to treat diseases based on regulating the impact of extracellular matrix on disease progression. 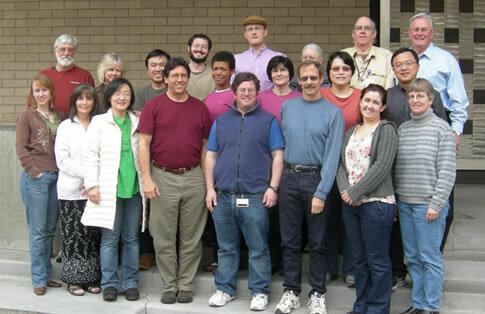 The Matrix Biology Program is one of five major research programs at BRI. The Program focuses on the extracellular matrix (ECM) which is the material surrounding cells. We study how this material interacts with cells and contributes to human pathology. Our approach includes research at both the basic science and translational levels and focuses on how the ECM contributes to heart and blood vessel diseases such as atherosclerosis, restenosis, myocardial infarction and diseases of the immune system such as type 1 diabetes. The research also involves the use of tissue engineering to develop replacement tissues utilizing ECM-designed approaches to create artificial blood vessels to replace diseased coronary arteries, patches to repair damaged heart muscle after myocardial infarction and implants of insulin-producing pancreatic cells to treat type 1 diabetes. The research direction is two-fold; first, to determine how cells produce and organize an ECM to control their phenotype and the inflammatory and immune systems during normal tissue homeostasis, and second, to learn how the ECM is altered in disease, especially inflammatory and autoimmune diseases. The overall goal is to develop therapeutics to treat these diseases based on strategies to regulate the impact of the ECM on disease progression.